We are flattered if you enjoy our content and are welcome to subscribe to our RSS feed. But we ask that you do not copy our content. We put many hours of labor into our websites. If you wish to share info from our site with friends, feel free to link to our blog. 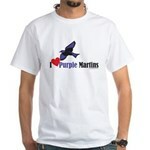 No materials from this Web Site or any web site owned, operated, licensed or controlled by PurpleMartins-R-Us,LLC. or PurpleMartinPlace.com may be copied, reproduced, republished, uploaded, posted, transmitted, or distributed for commercial gain. A link to our info is always welcome.